The Trump administration’s emerging Arab-Israeli policy focuses on Saudi Arabia and Israel with little concern for the Palestinians, who continue to protest for their rights, including a recent prison hunger strike, reports Dennis J Bernstein. On April 17, about 1,500 Palestinian prisoners in Israeli jails launched a hunger strike that lasted well over a month, demanding basic human rights — an end to the denial of family visits, proper medical care and treatment, access to higher education, and an end to solitary confinement, administrative detention, and imprisonment without charge or trial. 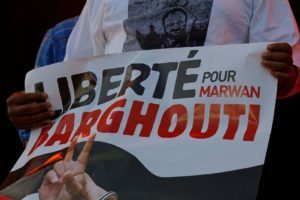 I interviewed Palestinian human rights activist, Arab Barghouti, about the recent hunger strike led by his father, Marwan Barghouti. Dennis Bernstein: I understand you just met with representatives for congresswoman Barbara Lee. Tell us about the meeting. What was the purpose. Arab Barghouti: I handed them a letter from me personally to the congresswoman, Barbara Lee. We are trying get attention of the American officials, of the American Congress, of any influential political high profile people who can help us raise the awareness and put some pressure on the Israeli government on this issue. The hunger strike has been going for long now. DB: Tell us more about the the strike and the strikers, led by your father. AB: This was one of the biggest hunger strikes in the modern history. Some 1,500 Palestinian political prisoners participated in it. My father, Marwan Barghouti, happens to be the leader of the hunger strike and he’s a Palestinian political leader who has been in Israeli prisons for 15 years. DB: Fifteen years. How old are you? DB: You’re 26, so your dad has been in prison most of your life. AB: Yeah, more than half of my life. DB: Did you see him arrested? DB: Did they arrest your dad at that point? DB: They occupied your house. AB: Yeah, they were looking for him. They brutally ask me “Where is your father?” As if I’m going to be lying. I was just a little kid who didn’t understand anything. After they left a few days, they stayed a few days in our house. After a few weeks I was looking at the television with my family and I saw, maybe, the worst moment of my life, I saw my father surrounded with Israeli soldiers, and it was really tough for me. I started crying and I didn’t know, I didn’t even understand that it’s going to take him that long – like we’re talking about 15 years. And my whole life hasn’t been with my father. He’s a respected political leader and maybe the most popular Palestinian leader in Palestine. DB: So, you grew up, when you had the chance, looking at him through the bars in prison? AB: Yes, I haven’t touched my father in 15 years. DB: You haven’t touched your father in 15 years. AB: Yes, even to shake his hand. I’m not allowed to, and they give me permission to go see him once every two years. I haven’t seen my father in two years. DB: You haven’t seen him. You get once every two years. AB: That’s it. And when I go to visit him, the journey takes me 20 hours and then I can barely have 45 minutes with him. I talk to him on the telephone where I can barely hear his voice. It’s frustrating, and it’s a humiliation not only for the prisoners, but also for all the families of the prisoners. DB: And I wouldn’t be lying would I, if I said the story you’re sharing with us represents the story of hundreds of thousands of Palestinians? Here’s a recent statement from your dad after 15 years behind bars: “Rights are not bestowed by an oppressor. Freedom and dignity are universal rights that are inherent in humanity, to be enjoyed by every nation, and all human beings. Palestinians will not be an exception. 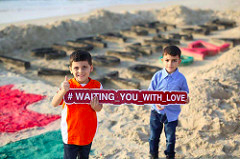 Only ending occupation will end this injustice and mark the birth of peace.” I want to talk about the current situation, and just a little bit more about your dad–his intellectual background and what the family, the Barghouti family, has been up to for the past seven generations. AB: The Barghouti families is one of the biggest families in Palestine. We have more than 20,000 people around the world, not only in Palestine. Because we all know that a lot of Palestinians are refugees, and were kicked out of their country and their homes back in 1948, and back in 1967. My father has been resisting the Israeli occupation for more than four decades. He has been in prison before, more than six years. He was excised from Palestine, kicked out seven years. But at the same time he is a Palestinian parliament member, elected twice. AB: Yeah, and he is currently a parliament member. He is also, he is a well educated man. He took his PhD in political science from Cairo University. He is very well recognized locally and internationally. And when we say internationally, we are talking about icons like Nelson Mandela, himself, who supported publicly, my father and his release. My father’s nickname is the Palestinian Mandela. We are talking about the former U.S. president who sent us a video, Mr. Jimmy Carter, sent us a video talking about the necessity of the release of Marwan Barghouti. And the necessity of his role in that peace operation. Angela Davis, a Nobel Peace Prize laureate. My father is nominated for the Nobel Peace Prize. He is recognized from hundreds of parliamentarians around the world. The European Parliament voted for the release of Marwan Barghouti. Cities in France, Italy, South Africa, and all over the world gave him the honorary citizenship. This gives you the idea that when the Israeli government says a terrorist, about him, and about all the 6,500 Palestinian political prisoners, it doesn’t mean anything because he is supported by people who have been through this struggle and know the oppression very well. DB: And, clearly, they should be able to tell by the way in which his son represents him, something about who this man is. And, I just have to ask you one more detail. I hope you don’t think this is silly. But you are named Arab Barghouti. How did he choose that, because I guess it’s like you’re representing all the Arabs, is this it? DB: No, I understand. Yeah, that’s why I’m asking you. AB: Yeah, exactly. My father believes in the Arabic nationality. He believes also in honor. My brother’s name is called Sharaf which means honor in Arabic. And also it’s one of his principles that he lived on, the Arabic culture. And I really like it. Like people get shocked when they hear my name, but I like it. DB: Alright, Arab, I’ve got another question for you, now let’s getting back to the front line. So, please take a long moment, and describe the current conditions now that all prisoners, that these 1,500?…you say are on a hunger strike? DB: And all the others, I guess that includes children? leaders in there. Ahmad Sardar happens to be one of them, Bashir Shaheed. Also Mr. Karim [Yunis], who is spending the 35th year of his life in Israeli prisons. AB: Yes, it’s the longest political prisoner in the modern history. Mr. Karim said, in risking his life, “Even if we unfortunately have to die for this, it’s our right and rights are to be taken with our stomachs.” And my father said a hunger strike is the most peaceful way to protest against the injustice that has been practiced against him and his fellow prisoners. And they are taking this battle… when you look at it, they’re not asking for a lot. They are asking for family visitation, they are asking for the end of administrative detention which is holding prisoners for years without even visiting the trial court, without even being charged. Better health conditions. We have a lot of Palestinian sick prisoners. We have 19 with cancer. And they are not being treated humanely. We are talking about the end of solitary confinement. My father spent in the solitary confinement cell more than three years. DB: Three years in solitary. AB: This is inhumane. This is immoral. And they have been trying and trying to talk to the Israeli prison authority without even… they didn’t even answer them. So they had to take a step, and they did the hunger strike. Unfortunately, and sadly in this world that we live in 2017, we have 1,500 Palestinian prisoners asking for their very basic human rights. I ask everyone, especially the American people, to raise their voice against the injustice, not only in Palestine, but everywhere else. DB: It’s been my observation that when it comes to Palestine, the corporate press does not do a good job. This story is virtually non-existent, you must know. You follow the headlines. 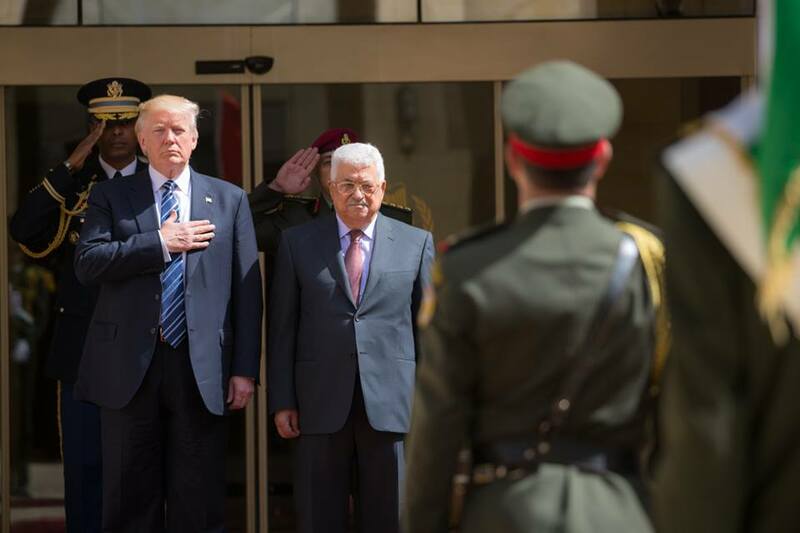 Trump was with Mahmoud Abbas. Trump is talking about the peace partners there. I’m wondering what do you think the strikers think about this–that visit? Did Trump make any effort to find out about torture, about the strike, about the suffering that’s going on? AB: I think the Palestinian prisoners are isolated from the rest of the world. They don’t know what is going on. They don’t know anything about what’s going on here. We have been asking human rights organizations, we have been asking the Red Cross, we have been asking everyone, to go at least tell us at least that my father is doing okay. We just want to know his health condition. DB: And, again, you haven’t seen him for two years. AB: I haven’t seen him for two years. And he was prevented… this hunger strike, from day one until now, from seeing anyone except once in the 28th day he saw his lawyer and… can you imagine after 4 weeks, you saw him once, and he told him like, how he was being tortured, and how they put him in a cell that barely could fit his body. It was super dirty. And he had to stop drinking water until they moved him to another cell. And when they moved him, they put noise and lights in his face so he can’t even sleep, and they fabricated videos about him eating, and they are being cheap and silly as always. And the only thing that they are not doing is just to negotiate the very basic human rights, that I don’t think are negotiable. We’re talking about very basic human rights, and my father and his fellow prisoners are not going to give up on this, on their very basic human rights. We are not talking about why they are there from the first place, because they shouldn’t be there. They are freedom fighters and they are resisting the occupation, legally. It’s legal to resist the occupation. If the average joe knew even a tenth of what Israel has stolen from the US economy Israel would be back on the interstate looking for a new nest to foul. Considering all the pro Israel Zionist Trump has surrounded himself with and appointed I think the gates to Israeli parasitism will be even more wide open. I have no hope whatsoever that Trump will put US interest ahead of his Israeli friends demands. Today the Section 301 Committee of the US Trade Representative formally received a petition demanding $6.64 billion in compensation for US exporters. In 1984 US exporters were urged to submit business confidential data about their prices, market share, internal costs and market strategy to the International Trade Commission. The USTR guaranteed confidentiality and compiled the data into a classified report for use in negotiating the US-Israel Free Trade Agreement. The Israeli government obtained the classified USTR report and passed it to the American Israel Public Affairs Committee to use in lobbying and public relations. Declassified FBI investigation files in the petition reveal AIPAC’s legislative director made illicit duplications before returning the report by order of the USTR. The FBI interviewed Israeli Minister of Economics Dan Halpern who admitted obtaining the classified document and giving it to AIPAC. Cal – “If the average joe knew even a tenth of what Israel has stolen from the US economy Israel would be back on the interstate looking for a new nest to foul.” That’s funny writing, Cal. I guess, in order to keep all this quiet, Israel should really own the media and Hollywood – whoops, they do! A country within a country. That never works. I use to be an avid follower of mondoweiss until I couldn’t take the constant reports and pictures of men women and children shot for no reason by bored IDF . It was making me murderous. So I have a hard time even saying anything about Palestine. because the 70 year and counting horror and injustice of it makes my head explode..
One thing I know—–you will never get Israel out of Palestine or any justice for Palestine until you get the Israel lobby and Fifth Column of US Zionist out of the US government and our media…and preferably out of our country. Any time anyone points out the dozens of Zionist led US policies for Israel they cry anti semite……well that slur quit bothering me a long time ago …..cause ‘Traitor trumps ‘Anti Semite every day of the week in every nation in the universe ..always has, always will. And that accusation scares politicians more than anything the zios can throw at them….So that’s what I use it for them and their bought US politicians. Cal – 13 cosponsors in the House, none in the Senate. Yes, “traitor” is the perfect word. Why Israel will never fight in a real war. For US Zionist the idea of Jews (in Israel) as some kind of super warriors is their viagra. But they will never fight a ground war—their military is more of a swat team for Palestines than an army. There are no career ground force sergeants except as technicians. Unless the system has changed very recently, the IDF ground forces typically do not have career NCOs in the LINE of the combat arms. This is a structural tradition that derives originally from the Russian tsar’s army and which came to Palestine through Russian and Polish Zionist immigrants. Ziofascism. So evil, vile, vicious. Indescribably evil, words fail. Tulsi Gabbard’s “Stop Arming Foreign Terrorists” bill has only 13 cosponsors in the House, and Rand Paul cannot find even one cosponsor for his companion bill in the Senate. Jessica, where is the Socialist Hero, Bernie Sanders? Is he going to build his Socialism while supporting waging all these Wars, death and destruction. I read some article couple of years ago – when Bernie was plotting his run in the primaries – that hinted that Bernie is a mole planted by the Establishment. He is now the out reach director under Chuck Schumer – the senator from City Bank. We live in the Alice in Wonderland kind of World. Posted on April 14, 2017 by Lori Lowenthal Marcus/JNS.org and filed under News, Israel, U.S. and tagged Main. U.S. Secretary of Veterans Affairs David Shulkin (left) and Israeli Deputy Defense Minister Eli Ben-Dahan meet in March. Credit: Gene Russell Photography. While U.S.-Israel military ties have long been known for foreign aid packages, intelligence-sharing and jointly developed missile defense technology, veterans affairs could be a major new frontier in that relationship. The seeds of this added dimension to already storied Israeli-American bonds were planted during last year’s U.S. presidential election, particularly in the eyes of Israeli government officials tasked with the care of injured and released IDF soldiers. Israeli Defense Ministry officials point out that then-candidate and now President Donald Trump significantly focused on issues pertaining to veterans on the campaign trail and has maintained that focus in the early months of his administration. Another relevant development for Israeli leaders is Trump’s selection of Secretary of Veterans Affairs David Shulkin, a Jewish doctor and hospital administrator who was unanimously approved by the Senate Feb. 13—no small feat in this hyper-partisan era. Within weeks, Israeli Deputy Defense Minister Eli Ben-Dahan and his advisers reached out to Shulkin, asking for a meeting. That meeting—the first of its kind between American and Israeli policy officials responsible for the care of injured and released (known as “discharged” in the U.S.) soldiers—took place in late March in Washington, D.C. It also marked Shulkin’s first visit with a foreign government official. “The level of anticipated cooperation brings what has long been a productive relationship [on military affairs], in terms of the purchasing of technology and sharing of information, to a whole new level,” Idit Druyan, an adviser to Ben-Dahan, told JNS.org. “Shulkin is extremely knowledgeable. He was very welcoming to us and open to listening to our ideas. We were excited by his interest in the work he wants to accomplish as well as his interest in our expertise,” she added. In some ways, the systems for working with injured and released soldiers in the two countries are very different. Israeli soldiers’ progression from the military health care system to the public system happens at the government level rather than at the individual’s initiative, as is the case in the U.S. Yet there are many similarities in the types of medical issues that arise. Treatment for post-traumatic stress disorder and suicide prevention are of great interest to both nations, and the leaders have agreed to pursue future cooperation on those fronts. Further, the Israeli leaders have welcomed the idea of the U.S. using Israeli experts for American presentations during international conferences at which Israel itself is not yet participating. Such an opportunity will allow Israelis to showcase their knowledge on a world stage for which they have, until now, largely been denied access. “Israel’s deputy minister for diplomacy Michael Oren has announced that ‘there is no Syria to negotiate with’, which means that Israel’s illegal occupation of the Golan should be recognized by the international community. Capitalizing on the chaos and destruction of a six-year war to push for international recognition of occupied land? That’s not very neighborly. Bombing the Syrian Army, NOT ISIS. No wonder nobody stopped all those young men flooding into Europe from Syria, many of whom, had they stayed, might have joined the Syrian Army. “Go in there, ISIS, and scare the crap out of all these young men, chop a few heads off, terrorize the towns and cities, and make them flee.” With substantial help from NGO’s and so-called humanitarian groups, they got rid of their competition, drove them out. Richard Falk’s book entitled “Palestine’s Horizon: Toward a Just Peace” just got published. Two of his university talks got cancelled because Zionist militants threatened to disrupt. Then they turned to giving him bad reviews on Amazon’s website, which took the ratings for his book down to the lowest level possible. He writes about how a new UN report “concluded that the evidence relating to Israeli practices toward the Palestinian people amounted to ‘apartheid,’ as defined in international law.” What did U.S. senators do? “DB: You haven’t touched your father in 15 years. Where are the Hollywood blockbuster movies about this? And no anger is supposed to be built up? If I was there, I’d be dead. The ground that some call Israel is soaked with the blood of those tortured and dispossessed. Does anyone expect two of the most evil actors on the world stage to have a concern for human rights? They will only express such concerns as a cover for their atrocities. Did the Americans value the human rights of the Native Americans or the African slaves? Does Israel have any concern for the Palestinians that they are trying to exterminate? If you think these State entities have any concern for human rights, you are deeply and dangerously deluded. Since theirs was taken away, I say the Palestinians should be given a homeland, even if it does belong to someone else. I suggest Brooklyn. If the natives balk at this reasonable proposition, drive them out with a tidy little war. The precedent seemed to work well in Israel, did it not? Good idea Realist! It’s on a par with Swift’s modest proposal. Brooklyn isnt enough, lets give them the whole state of Florida. They can throw the Jews out of their condos and then there will be plenty of housing. The Palestines are renowned farmers so they can take over businesses like the Fanjul brothers sugar monopoly under a law similar to the one Israel made up for itself in 1950 to seize all Palestine property. By classifying every citizen or persons present in an “enemy” territory or country as an “absentee” vis-à-vis property in Israel, they were able to confiscate the land, money, investments, homes and real estate left behind by the Palestinians who were forcibly displaced 1948. It is still in effect and used to confiscate Palestinian properties more than six decades later. Cal – Absentees’ Property Law – wow, unbelievable! When I explain Israel to the uninformed I ask them to imagine that Texas or Virginia was the Jews ‘promised land’ and in 1948 the UN awarded them the land already owned and inhabited by the Texans or Virginians .Then I describe what the Jewish immigrants would have done to them —the same as they did to the Palestines—-burn their crops, terrorize them, kill their livestock, poison their water wells, run them out of their homes, kill those who resisted etc..
Then I ask them what they would have done. Cal – when you allow people to visualize what it would be like for them, let them feel the anger and frustration, it sends a strong message. Good for you.